This is my translation of an article carried yesterday by La Repubblica. If you can, read the original here. “State of Denial”: an English expression that accurately describes the effect of the new revelations published Tuesday by La Repubblica and the Daphne Project coordinated by Forbidden Stories, throwing light once more on the undiscovered darkness of the investigation on the motive and the principals behind the murder of Daphne Caruana Galizia, the Maltese journalist killed in a car bomb on 16 October 2017. There where denial is not the same as disputing facts or circumstances revealed by journalistic investigation. Facts are simply pushed aside. For the second time in six months, in the background of the murder, we find again the Economy Minister from the Labour Party Chris Cardona. Once again new witnesses found by the Daphne Project have pointed him out in the company of one of the assassins Alfred Degiorgio. On the other hand for the first time, we have shown that at least some links exist between the island’s illegal underworld (smuggling of cigarettes, marijuana and fuel) from where Daphne’s killers were chosen and the Edifice of Politics (Joseph Muscat’s cabinet). A person already identified in the investigations on fuel smuggling is in touch with Cardona and Alfred Degiorgio. His name, that on Monday the Daphne Project decided not to publish as he could not be contacted, now no longer needs to remain hidden. His name is Pierre Darmanin. You can read about his links with the network of smugglers on the island in another Daphne Project story by Cecilia Anesi, Lorenzo Bagnoli and Giulio Rubino. The nature and depth of his links with Minister Cardona and Alfred Degiorgio remain mysterious. Malta Today spoke to Darmanin on the phone but he did not say anything beyond confirming his communication with Cardona and Degiorgio (two separate calls in October 2016, after Darmanin spoke with Daphne who was investigating the background of the umpteenth revenge bombing in the smuggling world). The promise of explaining in writing his reasons for those communications remained a promise. Darmanin asked Malta Today to speak to him on Whatsapp (precisely how Daphne Project tried to contact him in vain for three consecutive days asking him for his version but receiving no acknowledgement apart from a confirmed receipt). At that point, he vanished again. 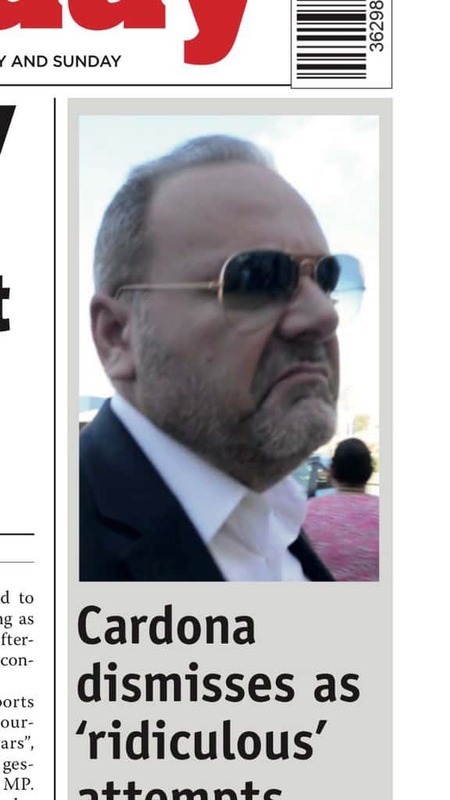 There’s no difference in the attitude of Minister Cardona. Yesterday afternoon on his way into Parliament in Valletta he had a smug smile saying he would clarify everything in the chamber. He would have to clarify the reason why he met one of Daphne’s killers before and after the murder (at a bar on the island and at a bachelor’s party). And above all, he would have to explain why last April he denied even knowing at least one of Daphne’s killers. First, he denied it to the Daphne Project, and then to the Maltese media and Parliament. The promise of candour was just a bluff. Yesterday Cardona cleared up nothing, apart from confirming at last that he had met Degiorgio, clumsily fixing his original version of facts. Now the Minister concedes it is true: “I cannot rule out that as a lawyer who goes to many places on the island I might have found myself with unsavoury people”. ‘State of denial’ indeed. He twists any explanation on the merits of the question put to him and to the entire Labour government. He chatters that nothing is proven. The government to whom he belongs, even yesterday, transforms a Parliamentary sitting into a bullfight with Malta’s Prime Minister Joseph Muscat, rather than publicly demanding his Economy Minister to give an account of his meetings with one of Daphne’s killers (or perhaps explain the context in which they occurred), he beats on the Nationalist Party opposition for demanding answers after the new discoveries published by the Daphne Project. Joseph Muscat labelled the former leader of the PN “a fraudster who should not be allowed in Malta”. He does this as he waves about a judicial inquiry — the one that last July ruled that Daphne’s stories on Egrant, named as the vessel for transferring a million dollars in bribes from the Azerbaijani regime to the prime minister’s wife Michelle Muscat — were “false”. He does so even though he is the only one to have seen the inquiry report. The opposition has been denied a copy of the grounds for the findings or the evidence included in the report (a matter appealed at the constitutional court). Maltese and international public opinion is also being denied access to this inquiry report. A hellish noise machine, that apparatchiks call spin: the blinding of public opinion instead of accountability and responsibility that should be at the heart of the DNA of a former British colony where Rule of Law should be the basis of institutions and the political culture. The noise is intended to confuse. (The prime minister’s crew venomously let it be known that Darmanin in the past used Daphne’s husband as his lawyer. As if that is an answer to the relationship between Darmanin and Cardona whose job is to be a government Minister). And above all the noise is intended to wipe out the solid facts discovered in these 12 months since Daphne’s death. Instead, once again, we see how the emergence of the truth on the motive and the principals behind the murder is clearly unbearable for the present government. To such an extent that 5 MEPs — David Casa (Malta, PN), Ana Gomes (Portugal, Socialist), Monica Macovei (Romania, Liberal-Democrat), Maita Pagazaurtundua (Spain, Socialist) and Stelios Kouloglou (Greece, Syriza) — have asked the European Commission to continue monitoring the island’s inquiry into Daphne’s murder and to back the Caruana Galizia family’s request for a parliamentary inquiring commission to determine the truth which right now appears to be a hostage to political calculus. Perhaps it is a hostage because the truth is politically unbearable. This is even more important when we are dealing with a government where everyone seems to be a prisoner of blackmail. Where two key characters, chief of staff Keith Schembri and Minister Konrad Mizzi, remained in their place in spite of revelations on their affairs (both own off-shore companies set up to receive bribes from the Azerbaijan regime). And where no one seems to have the urge to provide a single word of explanation on “Pilatus Bank,” the pocket of the Azerbaijani regime in Malta, the laundry for shady money (250 million euro in deposits) that was licensed by the Labour government in 2014 to operate in the eurozone and where Schembri opened an account to receive funds suspected of being corrupt fees. Daphne had named him long before as the owner of that account in a bank whose owner, Ali Sadr Ahmadinejad is now detained in the USA and is facing 125 years of prison for money laundering and bank fraud.